BBC Radio 4 Extra - Why Go? 4 Extra Debut. Chris Ledgard investigates the board game Go. Its ancient oriental rules mean that it is neither a race nor a battle. From May 2010. 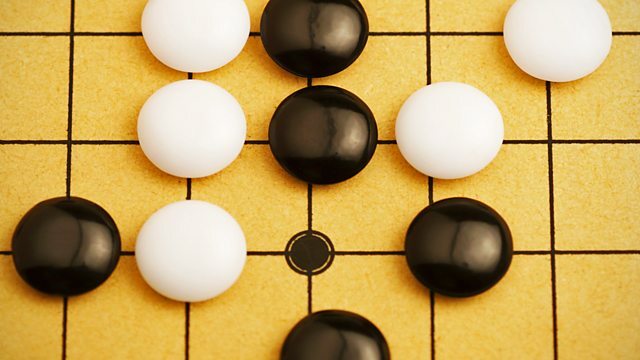 The game of Go expresses "a psychological essence" of the Far East, according to the British Museum's Dr Irving Finkel. It's ancient, but no-one knows quite how old - the claim that it originated 4,000 years ago is open to question. What's beyond doubt is its place in oriental culture. The remarkable cave of Buddhist treasures discovered at Dunhuang on the Silk Road through China included a 6th century Go manual now kept in the British Library. Miniature Go boards and pieces have turned up in ancient burial sites. In the twentieth century, some of Japan's finest writers turned to Go for inspiration, following major games and probing the psychology of the top players. And, as the first atomic bomb fell, two of the world's best exponents of Go were playing a title match on the outskirts of Hiroshima. But Go is little known in the West. This is in spite of the efforts of one of the two players in what became known as the Atom Bomb Game, Iwamoto Kaoru, who spent his later years setting up Go Centres in Europe and the Americas. In Why Go?, Chris Ledgard explores the world of Go, talking to experts in the East and West about the game's history and culture, and examining some its ancient artefacts. Dr Finkel discusses Go's place in the history of games. After Go, he says, "you could argue that the world's board games went downhill." Susan Whitfield, the Director of the International Dunhuang Project, brings the fifteen hundred year Go manual out of storage and explains how it was discovered and what it tells us. Britain's two foremost experts on the game describe how they got hooked, and Chris Ledgard visits Amsterdam to examine Iwamoto Kaoru's legacy and find out why, in spite of all the time and money he spent, relatively few people in Europe play the game. Go's Chinese name is weiqi, which is often translated as "the surrounding game". It's a game of co-existence. Two players, one with black stones the other with white, place their pieces on the intersections of a board marked with 19 x 19 lines. The aim is to secure territory and the emphasis is on long-term strategy, subtlety, and not bludgeoning your opponent. In Why Go?, Rob Foster, a translator of the Dunhuang manal, describes the game as "a conversation...it's hand talk". And the programme addresses the key question of whether - as some argue - Go reflects aspects of oriental thinking and is a game few western players really understand.